During the months from May to October, one pilgrimage each will take place for spiritual professions at Abbazia di Novacella. 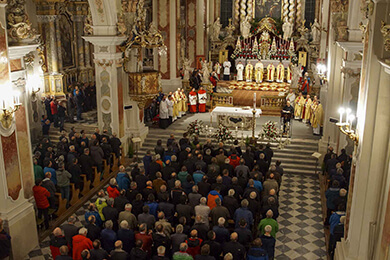 The traditional men’s night pilgrimage of the Catholic Men’s Movement of South Tyrol starts the series of summer pilgrimages every May 13, the Feast of Our Lady of Fatima. 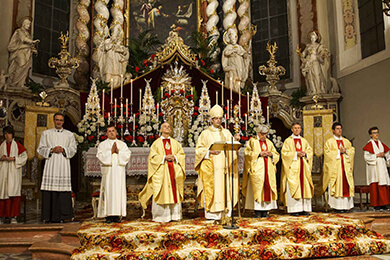 On the subsequent Fatima feasts on the thirteenth of the month, our Abbey’s parishes will organize the evening services with subsequent candle processions in the months of June, July, September, and October. 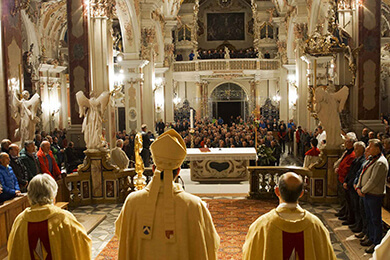 On the Solemnity of Augustine, our order’s father, on August 28, the community of canons will celebrate the solemn Pontifical Mass with their Provost Eduard Fischnaller. You are cordially invited to these special services in 2018, as well.